The factors that go into the composition of national debt vary by accounting standards. These different standards can make a big difference in the stated size of a country’s national debt and this is particularly true in the case of Austria. 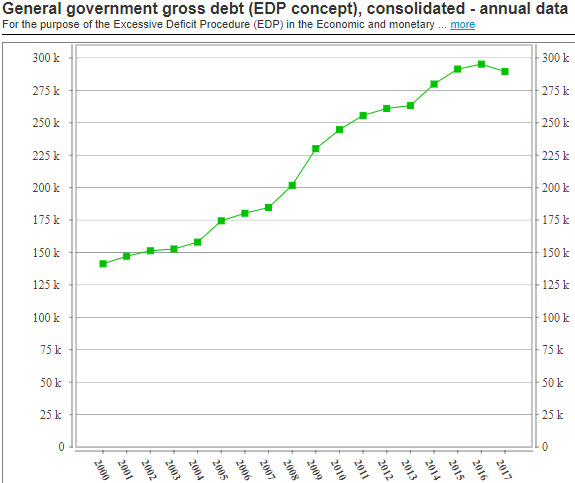 Eurostat follows the same rules that national governments in Europe use to calculate national debt. These guidelines are laid down in the Maastricht Treaty to ensure that the economies of all EU members are measured by the same methods. The IMF uses almost exactly the same rules, except that it records debt values at market prices rather than nominal value, which is the amount that the debt instruments were issued for. The IMF doesn’t include government loan guarantees, but Eurostat records a country’s obligations and guarantees to European institutions. The OECD includes factors that neither the IMF nor Eurostat include. These are mainly the guarantees given by a national government to other institutions within the country. This includes both private and public sector bodies, such as the country’s banks (private) and the national railways system (public). The OECD figures are around twenty five percent higher than the calculations given by the IMF and Eurostat. OECD national debt calculations are usually higher than those given by the IMF and Eurostat, but the difference in the case of Austria is one of the largest of all of the countries monitored by these two bodies and signifies that the Austrian government has backed a lot of loans to other organizations within the country. The IMF also routinely publishes net debt figures. The gross national debt of a country is all all of the debts represented by formal agreements, which means loans plus bonds. As explained above, obligations are also added to the national debt figures in varying degrees. Net debt is the gross debt minus all of the financial assets held by the country’s government. The IMF calculated that the net debt to GDP ratio of Austria was 54.3% at the end of 2017. When compared to a gross debt to GDP ratio of 78.8%, you can see that the Austria government could easily pay off about a third of the country’s national debt if it sold off its assets. Is Austria’s national debt growing? Austria’s national debt to GDP ratio over the years of this century is shown in the graph below. These figures come from Eurostat. The debt to GDP ratio stayed within the 65 to 70% range right up to the global financial crisis of 2008. That event caused the Austrian national debt to rise quickly for two years. After the effects of the crisis subsided, the Austrian government settled back into its policy of keeping the debt to GDP ratio within a five percent range. However, under post-crisis conditions, the government has made that range higher at between 80 and 85%. The national debt of Austria is too high because under the Maastricht Treaty, all EU nations are obliged to bring their national debt to GDP ratios under 60%. In 2017, the government broke out of its five percent range to get the debt falling to the 60% level. The Austrian economy has grown constantly this century, except for a slight fall in 2009. This means that a debt to GDP ratio that stays within a 5% range, is actually constantly rising, because the GDP against which that ratio is calculated represents more money each year. 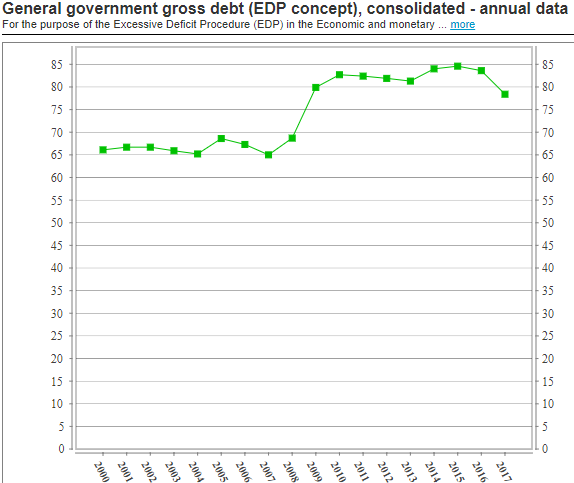 The graph below from Eurostat, shows the Austrian national debt in real terms. The figures plotted on the graph are in millions of Euros. The graph shows that 2017 was the first time this century that the Austrian government actually reduced the national debt. What is Austria’s credit rating? The Austrian government pays attention to the ratings awarded by four of the world’s leading credit rating agencies. Of these, the Dominion Bond Rating Service gives Austria a “triple-A.” The “AAA” credit rating is the highest score possible. The other three ratings agencies do not rate the country’s creditworthiness as highly. However, all of them give Austria an A-grade rating. It is doubtful whether Austria will be able to get a full complement of triple-A ratings without brining its national debt down to the Maastricht target of 60%. In order to achieve that goal, the government will need to pay down the debt in absolute terms and not just rely on rising GDP eroding the debt to GDP ratio. 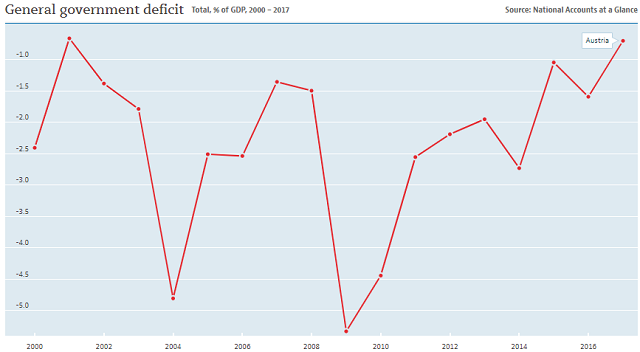 The graph below from the OECD shows that the Austrian government has run an annual budget deficit for every year this century. Who manages Austria’s national debt? The parliament of the Republic of Austria has the ultimate responsibility for the debts of the country. All accounts and plans of the ruling administration have to be passed by the parliament before they can be implemented. The government’s Ministry of Finance sets the annual budget, and so takes the decision each year on whether to increase or reduce the national debt. 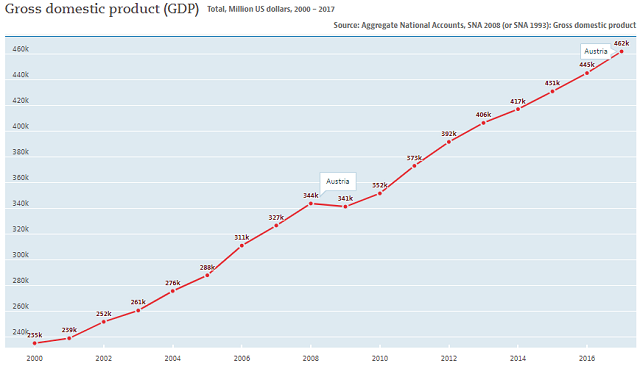 As the graphs in the previous two sections of this report show, the Austrian government usually chooses to increase the national debt. So, funds need to be raised. The task of managing the national debt and issuing government securities is the responsibility of the Österreichische Bundesfinanzierungsagentur, which is the Austrian Federal Financing Agency. How does the Austrian government raise loans? Treasury bills and government bonds are only sold directly by the Agency to an approved list of dealers. This creates the “primary market” and the approved buyers are called “primary dealers.” The primary dealers then resell those assets on the Vienna Stock Exchange, which is the secondary market for Austrian government securities. Any one can buy Treasury bills and bonds on the stock market. Medium-term notes are sold directly into the market through the mediation of a commercial bank. Euro Medium-term Notes (EMTNs are listed on the stock exchanges of Vienna and Luxembourg. These may be denominated in any currency and have maturities between 7 days and 70 years. These are governed by English law. The Australian Dollar Medium-term Notes are registered on the Sydney Stock Exchange and are governed by Australian law. What types of bonds does the Austrian government issue? Treasury bills provide short-term financing for the Austrian government. These devices have maturity dates of up to one year minus one day. They are tradeable on the Vienna Stock Exchange. Austrian Treasury bills do not pay interest, but they are sold at a discount and redeemed at full face value. Austrian government bonds can be structured to pay either a fixed rate of interest or a floating rate. Maturities can be up to 100 years. However, they usually have maturities of 5, 7, 11, or 15 years. Interest is paid annually in arrears. In 2017, the Austrian government issued a zero-interest five-year bond. What facts should you know about Austria's national debt? You could wrap $1 bills around the Earth 1,406 times with the debt amount. If you lay $1 bills on top of each other they would make a pile 39,455 km, or 24,516 miles high. That's equivalent to 0.10 trips to the Moon.